Mars Hill University on Wednesday played its first athletics event on what is now called the David Riggins Court. The university renamed the playing surface in Stanford Arena in honor of Riggins, who is retiring at the end of the year following a 32-year career as a basketball coach and athletics director. Riggins Court is home to the university’s Mountain Lions basketball and volleyball teams. Wednesday’s men’s basketball game christened the court in fine fashion, as the Lions defeated Erskine College, 87-65. At that same ceremony, the commissioner of the South Atlantic Conference, of which Mars Hill is a member, announced ) a new award called the SAC David Riggins Service Award. It will be awarded each year to an administrator for outstanding service to the conference. Riggins began his career at Mars Hill in 1986 as the head basketball coach, a position he held until 1999. He is the university’s all-time winningest coach. During his tenure as head coach, Riggins coached 16 All-Conference players, one All-American, two-All-Region players, two SAC Freshman of the Year, one SAC Player of the Year, one SAC Male Athlete of the Year and 11 of his players entered the school’s 1,000-point club. Riggins has the distinction of having three former players who have been inducted into the South Atlantic Conference Hall of Fame. Riggins was inducted into the Mars Hill Athletics Hall of Fame in 2007. 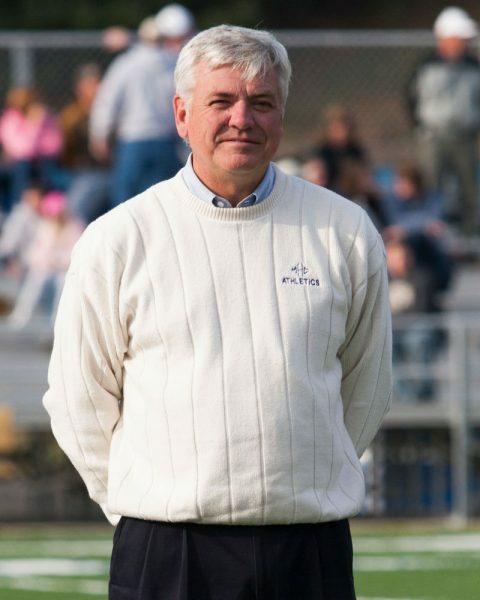 In 1993 he added duties as assistant athletics director and in 1999 became the university’s director of athletics. Since assuming that role, the Mars Hill athletics complex has seen a face lift. Meares Stadium saw the installation of synthetic turf and the W. Scott Merrill Press Box along with refurbished seating for the home grandstand and improved visitor seating. Upon completion, the complex assumed the name as the Ammons Family Athletic Center and Meares Stadium. It now serves as the home for the football, men’s and women’s lacrosse, and men’s and women’s soccer teams. In addition, a new softball facility was completed on Ponder Field along with the construction of two football practice fields. Belk Field saw the addition of a new practice facility which houses men’s and women’s soccer and men’s and women’s lacrosse. That facility was upgraded with a new irrigation system and installation of natural turf. In spring of 2013 the Lions baseball team moved into the new Henderson Field. The 2012-13 year also saw the addition of a new 2,100-square foot weight room in Chambers Gym. In February of 2019 the Lions will move into the new Jo Ellen Ammons Field House which will be home for football, women’s soccer, tennis, and golf. Riggins and his wife, Rita, reside in Weaverville. They have two grown sons, Chase and Kyle.